If you have hard boiled eggs on hand and want to do something creative with them, try one of these recipes. Place eggs in a large saucepan. Add cold water to cover eggs by 1 inch. Place over high heat and bring to a boil. Remove pan from burner, cover, and let sit for 10 minutes. Drain and serve warm. Or cool under cold running water and then refrigerate. 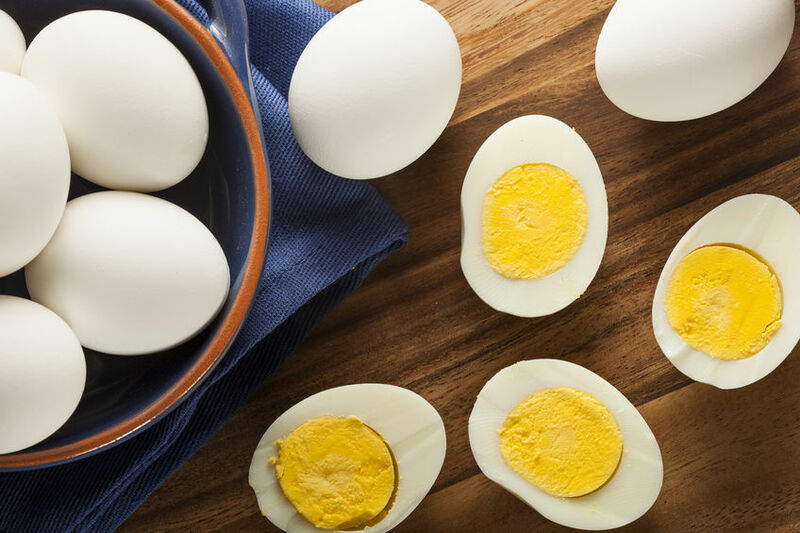 Hard-boiled eggs will keep for 1 week. Tip: super fresh eggs are harder to peel than eggs that are a week old. In a heavy saucepan over medium heat, melt the butter and add flour, stirring constantly. Slowly whisk in the broth and milk and stir until thickened. Whisk in mustard. Season with salt and pepper. Drizzle the sauce over the warm eggs and sprinkle with parsley. Serve with boiled potatoes. In a greased 11 x 7-inch baking dish, pour in broccoli and top with eggs. Distribute ham and onions over eggs. In a saucepan, melt butter and add flour. Cook and stir until bubbly. Gradually whisk in milk, mustard, salt and dash of paprika; cook and stir until boiling then continue for 2 minutes more. Remove from the heat; stir in 2 tablespoons cheddar cheese until melted. Pour over casserole. Sprinkle with remaining Parmesan cheese. Bake, uncovered, at 400° for about 15 minutes or until heated through. Cut each egg in half, lengthwise. Gently remove the yolk halves and place in a small mixing bowl. Arrange the egg white halves on a serving platter or shallow container. Using a fork, mash up the yolks and add mustard, mayonnaise, onion, salt and pepper. Spoon egg yolk mixture into the egg white halves. Sprinkle with paprika. Makes 2 dozen. Place potatoes and salt in a large pot and cover with water. Bring to a boil, reduce heat and cook for 10-15 minutes or until tender. Drain, cool, peel, and cut into cubes. Place potato cubes in a large bowl. Add the eggs, onion, celery, pickle, and bacon. In a small bowl, combine the mayonnaise, mustard, vinegar, lemon and salt and pepper. Pour over potato mixture and toss gently to coat. Refrigerate until chilled. In a small pot, combine the soy sauce, vinegar and sugar and bring to a simmer over medium heat, stirring until sugar is dissolved. Add the eggs and use a spoon to roll them around in the mixture, until the eggs are a uniform cappuccino-brown color. Remove the egg from the pot and let cool slightly before eating.